Natsuko Yoshimoto studied violin at the Yehudi Menuhin School from the age of 11 and was taught by Lord Menuhin and Wen Zhou Li. She received scholarships at the Curtis Institute of Music in Philadelphia and the Royal Northern College of Music in Manchester. 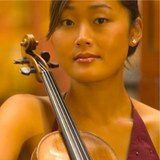 Natsuko won the Gold Medal in the 1994 Shell / London Symphony Orchestra competition and performed at Buckingham Palace in the presence of the Queen. Natsuko is in demand as both a chamber musician and soloist. She has appeared at major international festivals and with orchestras including the Philharmonia (UK), London and Tokyo Symphony Orchestras and most recently with Orchestra Ensemble Kanazawa under Iwaki Hiroyuki.Natsuko most recently performed with the HSO in the 2006 June 17th and 18th concerts, performing the Sibelius Violin Concerto in D minor. Natsuko was a member of the Australian String Quartet from 2001 to 2006 when together with James Cuddeford and Jeremy Williams who were also members of the Australian String Quartet, joined with renowned American cellist Peter Rejto to perform throughout Australia and overseas as the Grainger Quartet.